Towing dolly hire in the Surrey area?? 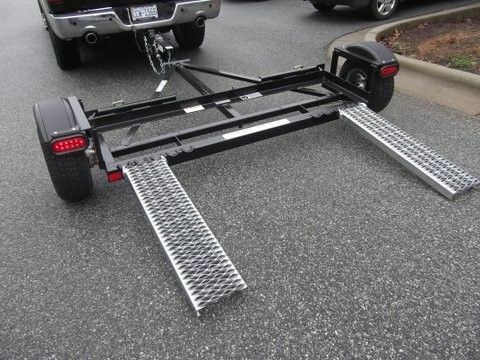 Does any member in or around the Surrey area have a towing dolly they'd like to hire out or know of anyone who may be able to? Re: Towing dolly hire in the Surrey area?? AFAIK, if you're worried about being legal, you can't use a dolly for anything other than removing a broken down vehicle to a point of safety? According to this you can use a dolly that has brakes and suspension to tow an operational car, provided that the brakes on the wheels of the car that are on the road are operational? scimjim wrote: According to this you can use a dolly that has brakes and suspension to tow an operational car, provided that the brakes on the wheels of the car that are on the road are operational? with a maximum of 20 miles per hour on all roads other than a motorway which is 40. Way outside the weight limit then, but if it's not far I'd probably do the same. I'll move this to scimaritans as I think it's better suited there.